As first appeared in the September 2009 edition of the Syracuse Astronomical Society newsletter The Astronomical Chronicle (PDF). I spent three years observing at our tree-lined Observatory with nothing more than a pair of 12×50 binoculars (my trusty Nikon Actions) and a tripod on one of the Darling Hill concrete platforms. On the platform to my left, often Mike Brady’s 12″ Meade LX200. My binoculars would fit easily in his scope. To my right, often Nate Bryant’s 14″ Orion Deep Sky scope. You could fit Mike’s scope in Nate’s. To the uninitiated, one would wonder what someone with a small pair of binos was doing taking up valuable space for a yet larger telescope! The answer is simple: in a hobby dominated by efforts to zoom in on objects that dwarf our planet, our Sun, our Solar System, and well beyond, sometimes the best view is of the forest and not of the trees. With that small digression aside, we consider four small Constellations, themselves surrounded by giants, but together accounting for several wonderful views in scopes of all sizes. Delphinus, Equuleus, Velpecula, and Sagitta are bordered by Aquarius, Pegasus, Cygnus, Hercules, Lyra, and Aquila. Each of these four small Constellations seem to be almost an afterthought, small scribbles of lines between medium stars that an ancient astronomer or Hevelius himself could not imprint a mythological image upon. Despite their being four of them in a close space, this collection takes up less acreage of sky than any of the larger Constellations surrounding them (Lyra notwithstanding). 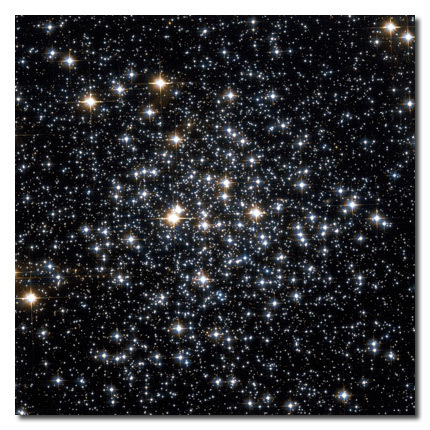 This does mean that there are only a small number of easily recognizable objects within their combined borders, but that also means these objects, like the small cluster of Constellations themselves, are reasonably easy to find. 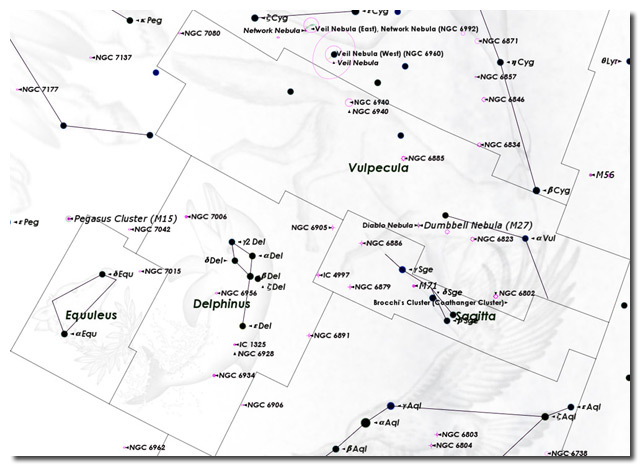 The search for these Constellations best begins (for me, anyway) with Delphinus. The small diamond and long tail are composed of five bright stars that stand out even in hazy evening skies. Within Delphinus are a number of dim NGC objects (7003, 7025, 7006, 6956, 6972, 6917, 6934, 6954, and 6891) and two IC objects (1325 and 1326) but no brighter objects. For anyone looking to memorize the locations of these small Constellations, the distinctive shape of Delphinus is its most valuable asset. Only three of the stars in Delphinus have non-Greek alphabet, “common” names. Two of these, Sualocin (a-Del) and Rotanev (b-Del), are the switcho-reflecto result of the Latin-ization (sorry John McM!) in 1814 of Palermo Observatory (Italy) assistant director Niccolo Cacciatore (that’s “Nicolaus Venator.” Yes, just spell his name backwards). To the left of Delphinus is Equuleus, the “Little Horse” (or “The Foal”). I freely admit to not even knowing this Constellation by sight before writing this, yet Equuleus is a member of the “Original 48” in the almost 2000-year-old Constellation list of Ptolemy. There are only three stars of note in this Constellation, with the brightest (a-Equ) at magnitude 3.92. The notable NGC objects within its boundary (NGC 7015, 7040, 7045, and 7046) are at magnitude 13 or dimmer, making Equuleus notable only for its presence to the binocular astronomer (although one might use d-Equ as the “pointer star” to aid in finding M15, the Pegasus Cluster. Velpecula, the “Little Fox,” is the largest Constellation of the four by bordered space but possibly the least interesting by design. Velpecula is both little AND young, a result of the final partitioning of the sky by Hevelius and not part of the original collection organized by Ptolemy. 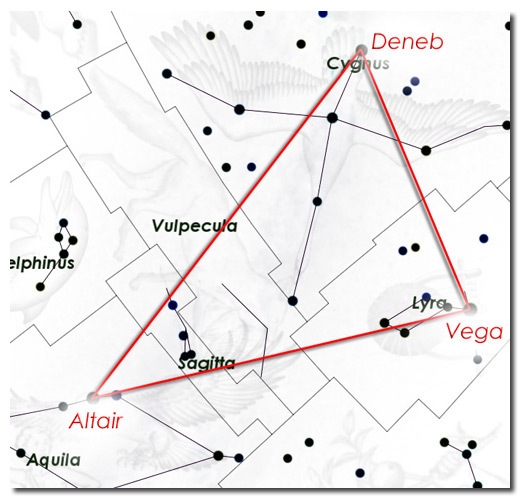 If you know Velpecula by sight, you likely have memorized it as the tiny beast trapped within the Summer Triangle (below), the bright asterism composed of Deneb, Vega, and Altair. 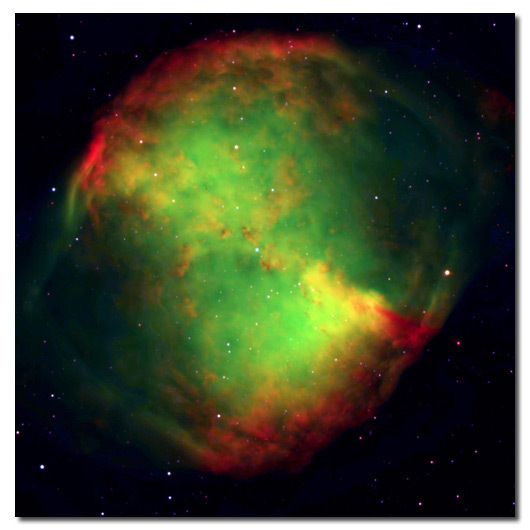 If you have its location memorized for deep sky viewing, you likely use it as the marker Constellation for M27, the Dumbbell Nebula (also below). But wait, there’s much more! Velpecula is home to the neutron star PSR B1919+21, the FIRST pulsar (at 1.3373 second intervals) discovered (in 1967). Closer to home (or the searches for other homes), the extrasolar planet HD 189733 b contained within the Velpecula boundary is a focus of the Spitzer Space Telescope. Similar in size to our own Jupiter, HD 189733 b was observed to contain water vapor in its atmosphere although, at an approximately 1000 oC temperature, that makes any plan for easy accessibility a little tough to swallow. Finally, especially for the binocular observer, Velpecula is the home to Brocchi’s Cluster, the asterism known to those that have ever seen it as “The Coathanger.” I will not even bother to post an image, instead referring you to the real thing. While within Velpecula, The Coathanger lies closest to bright stars contained within the final constellation of the quartet, Sagitta. Perhaps a lost arrow from the quiver of Sagittarius, Sagitta, Latin for “the arrow,” is shaped appropriately so and is as thin as the name implies. Sagitta is an ancient Constellation, a member of Ptolemy’s “Original 48” and one of only a few inanimate objects to be placed in the Night Sky (Lyra is perhaps the most well known of the ancient objects). Its mythology is more closely associated with Hercules than with Sagittarius, with Hercules using this arrow to kill Aquila, the eagle responsible for Prometheus’s dry spell (if that made sense to you, consider yourself well-versed and in ownership of a quirky sense of humor). Sagitta lies within the band of the Milky Way and contains one Messier Object within its boundaries (which, for the small size of the Constellation, is a testament to the accuracy with which this arrow was sent into the Night Sky). The globular cluster M71 (above) is available as a high-res Hubble image from wikipedia.org and it is well worth taking this forest of stars in for a short spell (direct link HERE).